Virginia ist ein Bundesstaat im Süden der Vereinigten Staaten von Amerika. Northern Virginia, the populous area bordering Washington D.C., is influenced by the city's urban culture. Eastern Virginia mit den touristischen Hotspots wie Colonial Williamsburg und Virginia Beach. Central Virginia is home to Richmond, Virginia's capital city, and features historic sites from the Revolutionary and Civil Wars. 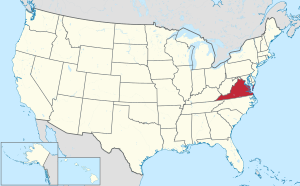 Southwest Virginia, also known as Virginia's highlands, is a mainly rural region defined by its Appalachian heritage. Shenandoah Valley is bordered by the Blue Ridge Mountains, a region to enjoy nature at Shenandoah National Park. Diese Seite wurde zuletzt am 20. Juli 2016 um 06:47 Uhr bearbeitet.